Serving Ozone Park, Woodhaven, Richmond Hill, JFK Airport, and Howard Beach neighborhoods since 1964. 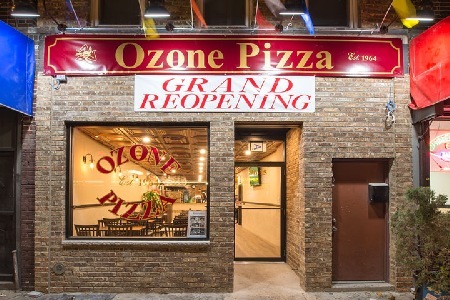 We at Ozone Pizza are on the frontier of a new era in take-out food. We take pride in making everything taste great, just like mom does! Specialty sauces and dough to let you enjoy the true flavor and quality of our food that you deserve. We only use the freshest ingredients and top quality cheeses in preparing our foods. We do have great pizza, like our specialty sicilian pies, but it doesn't stop there. We also have the best hippy rolls, and calzones around, fresh salads, pasta, hot dishes and of course chicken wings. For a pizza experience like no other ....... It's Ozone Pizza ....... the pizza of choice! Thank you for visiting our new Internet site. As an up-to-date business, we want to give you the opportunity to stay in touch with our business and our offers. We would be pleased to hear from you! We are a business that is open to feedback, so leave your comments and suggestions by clicking here. In brief, you should know the following about us: our business was established in 1964 by the families of Paul and Joe, and has been responsible for providing outstanding service ever since. Our regular customers particularly value our sicilian pies and our service.